Download "Country Operations Business Plan. Project Number: 26194. September 2012. 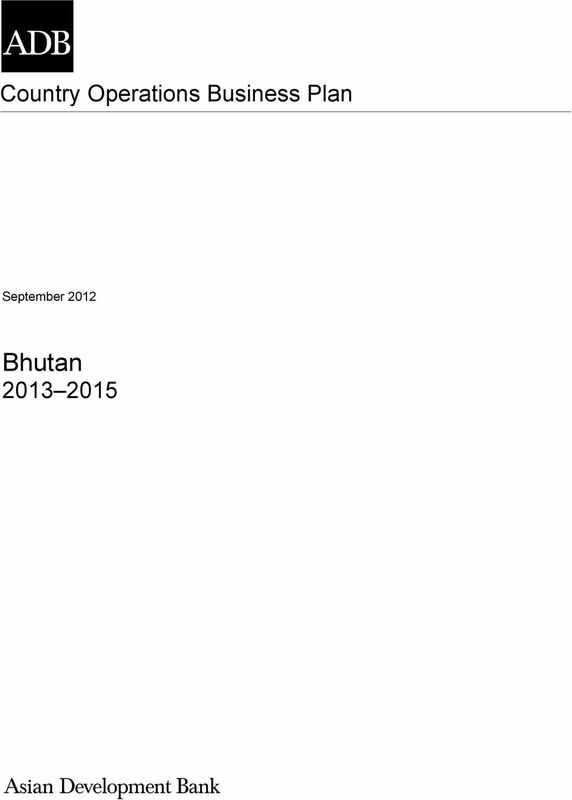 Bhutan 2013 2015"
2 CURRENCY EQUIVALENTS (as of 1 August 2012) Currency Unit ngultrum (Nu) Nu1.00 = $ $1.00 = Nu55.71 ABBREVIATIONS ADB Asian Development Bank ADF Asian Development Fund CPS country partnership strategy SASEC South Asia Subregional Economic Cooperation TA technical assistance NOTE (i) In this report, "$" refers to US dollars. Vice-President X. Zhao, Operations 1 Director General J. Miranda, South Asia Department (SARD) Director S. Bonu, Regional Cooperation and Operations Coordination Division, SARD Team leader Team members Y. Niimi, Economist, SARD A. Pangilinan, Associate Programs Officer, SARD Bhutan Country Team In preparing any country program or strategy, financing any project, or by making any designation of or reference to a particular territory or geographic area in this document, the Asian Development Bank does not intend to make any judgments as to the legal or other status of any territory or area. 4 1 I. CONSISTENCY OF THE BUSINESS PLAN WITH THE COUNTRY PARTNERSHIP STRATEGY 1. The interim country partnership strategy (CPS) for Bhutan for extends the validity of the CPS, to guide Asian Development Bank (ADB) operations for the remainder of the country s Tenth Five Year Plan. This country operation and business plan identifies lending and nonlending programs for fully in line with the direction and strategic priorities outlined in the interim CPS. II. INDICATIVE RESOURCE PARAMETERS 2. The biennial Asian Development Fund (ADF) allocation for is $44.76 million ($19.89 million for grants and $24.87 million for loans). Bhutan, classified as moderately debtstressed, will continue to receive its ADF allocation in the form of 50% loans and 50% grants, which is subject to a 20% volume discount. 2 The ADF resource envelope for is indicatively set for $46.83 million ($26.02 million for loans and $20.81 million for grants). The final allocation will be based on the revised estimate of ADF commitment authority, the 2012 country performance assessment outcomes, and the results of the 2012 debt distress classification. The indicative figure for the nonlending program is $1.73 million per year for Additional resources from the ADF subregional allocation will be actively sought for projects that have strong regional cooperation and integration efforts, such as those in the energy and transport sectors. The utilization of external resources and cofinancing will be actively explored for the energy sector, in particular, but also in other key sectors. III. SUMMARY OF CHANGES TO LENDING AND NONLENDING PROGRAMS A. Lending Products 4. The Urban Infrastructure Development Project (Additional Financing) will be consolidated into the Green Urban Development and Integrated Management Project, to be processed in The originally allocated $5 million of the ADF loan for the Urban Infrastructure Development Project (Additional Financing) was reallocated to the South Asia Subregional Economic Cooperation (SASEC) Subregional Trade Facilitation Program ($8.33 million ADF loan and $3.33 million ADF grant), to be processed in The Airport Transport Connectivity Enhancement Project ($6.92 million ADF grant) was approved in June The Green Power Development Project II ($40 million ADF hard-term loan and $80 million ordinary capital resources loan) 3 is added as a firm project in the 2013 program. The newly added Strengthening Economic Management Program ($14.19 million ADF loan and $20.81 million ADF grant) is a budgetary support program structured into two tranches focusing on policy initiatives for improving fiscal, debt, and liquidity management. 1 ADB Country Strategy and Program: Bhutan, Manila. 2 A 20% volume discount will be applied to the grant portion of the performance-based allocation to offset the risk of perverse incentives and moral hazard in replacing loans with grants for countries with poor debt management. 3 Proposed financing of $120 million comprising a $40 million ADF hard-term loan and an $80 million ordinary capital resources loan is subject to availability and compliance with requirements for accessing both the ADF Hard-Term Facility and ordinary capital resources funds. 5 2 6. The Road Network Project II (Additional Financing) was renamed the SASEC Road Connectivity Project as some regional cooperation and integration components were added, including the Phuentsholing mini dry port and northern bypass, as well as Pasakha access road development. It will be processed as a stand-alone project in 2014; its ADF allocation was adjusted to $40 million ($25.92 million ADF loan and $14.08 ADF grant). 4 The Urban Infrastructure Project (Additional Financing) was renamed the Green Urban Development and Integrated Management Project in response to some additional components, including one focusing on strengthening the management of urban infrastructure in water supply and sanitation. 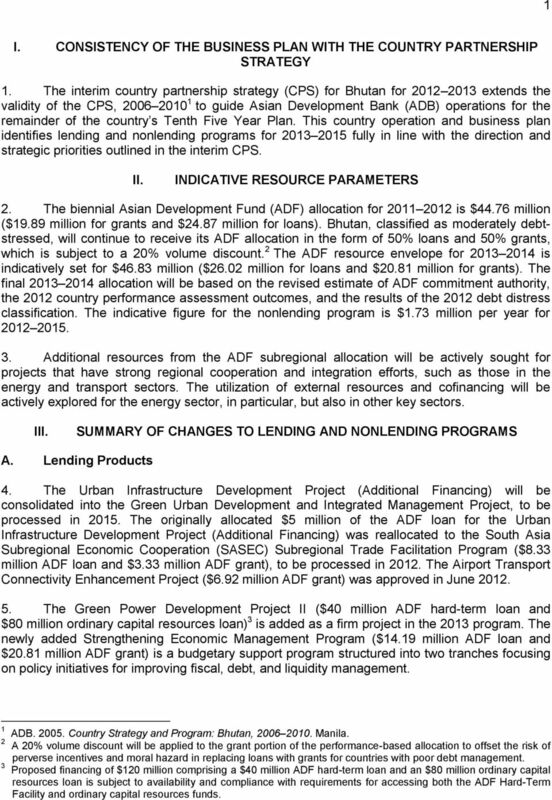 It will be processed as a stand-alone project in 2015; its ADF allocation was adjusted to a $20 million ADF loan. B. Nonlending Products and Services 7. The rationalization and consolidation of technical assistance (TA) projects were explored to enhance the efficiency of nonlending operations and reflect the government s evolving priority needs. The 2012 program includes three capacity development TA projects. The Strengthening the Royal Monetary Authority s Regulatory Capacity for Nonbank Financial Institutions TA was approved in May Capital Market Development will be a consolidated TA project that comprises the components from the originally planned Capital Market Development TA, as well as the recent government request for TA support for the National Pension and Provident Fund. It will also provide support for implementing the Strengthening Economic Management Program. The planned Poverty Assessment TA will be incorporated in the Strengthening Government Services Delivery TA. 8. 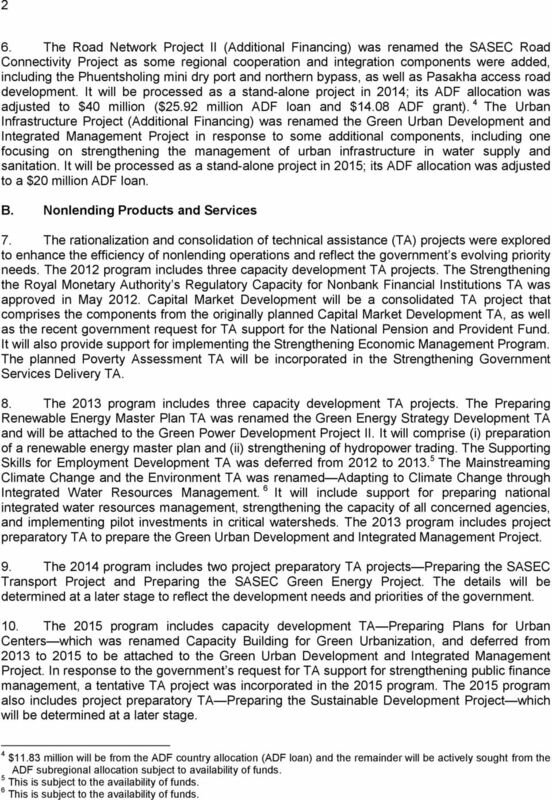 The 2013 program includes three capacity development TA projects. The Preparing Renewable Energy Master Plan TA was renamed the Green Energy Strategy Development TA and will be attached to the Green Power Development Project II. It will comprise (i) preparation of a renewable energy master plan and (ii) strengthening of hydropower trading. The Supporting Skills for Employment Development TA was deferred from 2012 to The Mainstreaming Climate Change and the Environment TA was renamed Adapting to Climate Change through Integrated Water Resources Management. 6 It will include support for preparing national integrated water resources management, strengthening the capacity of all concerned agencies, and implementing pilot investments in critical watersheds. The 2013 program includes project preparatory TA to prepare the Green Urban Development and Integrated Management Project. 9. The 2014 program includes two project preparatory TA projects Preparing the SASEC Transport Project and Preparing the SASEC Green Energy Project. The details will be determined at a later stage to reflect the development needs and priorities of the government. 10. The 2015 program includes capacity development TA Preparing Plans for Urban Centers which was renamed Capacity Building for Green Urbanization, and deferred from 2013 to 2015 to be attached to the Green Urban Development and Integrated Management Project. In response to the government s request for TA support for strengthening public finance management, a tentative TA project was incorporated in the 2015 program. The 2015 program also includes project preparatory TA Preparing the Sustainable Development Project which will be determined at a later stage. 4 $11.83 million will be from the ADF country allocation (ADF loan) and the remainder will be actively sought from the ADF subregional allocation subject to availability of funds. 5 This is subject to the availability of funds. 6 This is subject to the availability of funds. 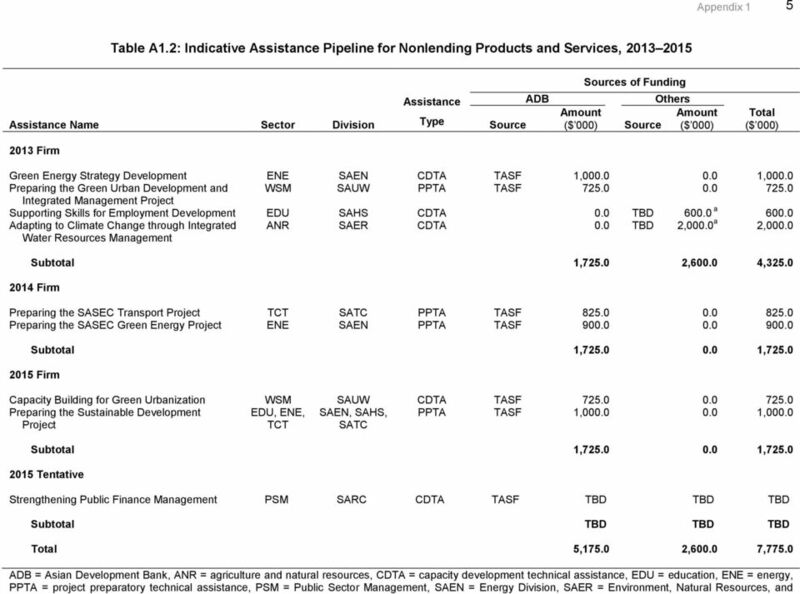 6 Appendix 1 3 INDICATIVE ASSISTANCE PIPELINE Table A1.1: Indicative Assistance Pipeline for Lending Products, Project/Program Name Sector Targeting Classification Primary Theme Division Year of PPTA / PDA Total OCR Cost ($ million) ADB ADF Loans Grants Total Gov t Cofinance 2013 Firm Green Power Development Project II Strengthening Economic Management Program ENE GI ENV, GRO, PSD, RCI SAEN a TBD FIN GI GRO SAPF Subtotal Firm SASEC Road Connectivity Project (formerly Road Network Project II (Additional Financing)) TCT GI GRO, RCI SATC b Subtotal Firm Green Urban Development and Integrated Management Project WSM GI EGM, ENV, GRO SAUW Subtotal Total ADB = Asian Development Bank, ADF = Asian Development Fund, EGM = effective gender mainstreaming, ENE = energy, ENV = environmental sustainability, FIN = finance, GI = general intervention, Gov t = government, GRO = economic growth, OCR = ordinary capital resources, PDA = project design advance, PPTA = project preparatory technical assistance, PSD = private sector development, RCI = regional cooperation and integration, SAEN = Energy Division, SAPF = Public Management, Financial Sector and Trade Division, SASEC = South Asia Subregional Economic Cooperation, SATC = Transport and Communications Division, SAUW = Urban Development and Water Division, TCT = transport and information and communication technology, WSM = water supply and other municipal infrastructure and services. 7 4 Appendix 1 a Proposed financing of $120 million comprising $40 million ADF hard-term loan and $80 million ordinary capital resources (OCR) is subject to availability and compliance with requirements for accessing both the ADF Hard-Term Facility and OCR funds. b $11.83 million will be from the ADF country allocation (ADF loan) and the rest will be actively sought from the ADF subregional allocation subject to availability of funds. Source: Asian Development Bank. 9 6 Appendix 1 Agriculture Division, SAHS = Human and Social Development Division, SARC = Regional Cooperation and Operations Coordination Division, SASEC = South Asia Subregional Economic Cooperation, SATC = Transport and Communications Division, SAUW = Urban Development and Water Division, TASF = Technical Assistance Special Fund, TCT = transport and information and communication technology, WSM = water supply and other municipal infrastructure and services. a This is subject to availability of funds. Source: Asian Development Bank. 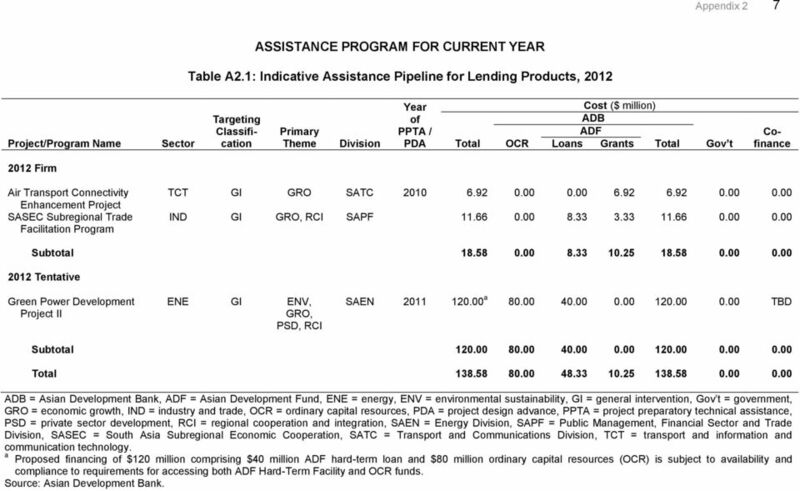 10 Appendix 2 7 ASSISTANCE PROGRAM FOR CURRENT YEAR Table A2.1: Indicative Assistance Pipeline for Lending Products, 2012 Project/Program Name Sector Targeting Classification Primary Theme Division Year of PPTA / PDA Total OCR Cost ($ million) ADB ADF Loans Grants Total Gov t Cofinance 2012 Firm Air Transport Connectivity Enhancement Project SASEC Subregional Trade Facilitation Program TCT GI GRO SATC IND GI GRO, RCI SAPF Subtotal Tentative Green Power Development Project II ENE GI ENV, GRO, PSD, RCI SAEN a TBD Subtotal Total ADB = Asian Development Bank, ADF = Asian Development Fund, ENE = energy, ENV = environmental sustainability, GI = general intervention, Gov t = government, GRO = economic growth, IND = industry and trade, OCR = ordinary capital resources, PDA = project design advance, PPTA = project preparatory technical assistance, PSD = private sector development, RCI = regional cooperation and integration, SAEN = Energy Division, SAPF = Public Management, Financial Sector and Trade Division, SASEC = South Asia Subregional Economic Cooperation, SATC = Transport and Communications Division, TCT = transport and information and communication technology. a Proposed financing of $120 million comprising $40 million ADF hard-term loan and $80 million ordinary capital resources (OCR) is subject to availability and compliance to requirements for accessing both ADF Hard-Term Facility and OCR funds. Source: Asian Development Bank. 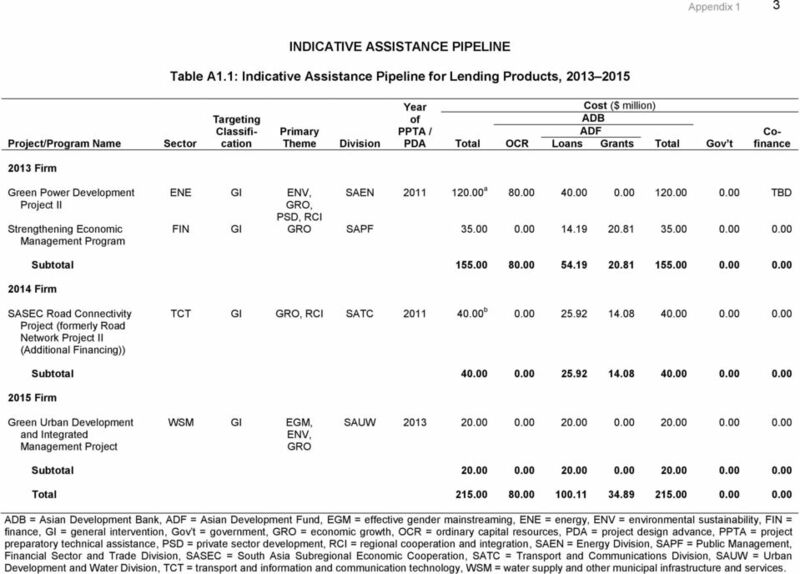 11 8 Appendix 2 Table A2.2: Indicative Assistance Pipeline for Nonlending Products and Services, 2012 Assistance Name Sector Division Assistance Type Source ADB Amount ($'000) Sources of Funding Others Source Amount ($'000) Total ($'000) 2012 Firm Strengthening the Royal Monetary Authority s FIN SAPF CDTA 0 JFPR Regulatory Capacity for Nonbank Financial Institutions Capital Market Development FIN SAPF CDTA TASF 1, ,250.0 Strengthening Government Services Delivery PSM SARC CDTA TASF Total ,250.0 ADB = Asian Development Bank, CDTA = capacity development technical assistance, FIN = finance, JFPR = Japan Fund for Poverty Reduction, PSM = public sector management, SAPF = Public Management, Financial Sector and Trade Division, SARC = Regional Cooperation and Operations Coordination Division, TASF = Technical Assistance Special Fund. Source: Asian Development Bank. Technical Assistance Loans to the Islamic Republic of Pakistan for the Sindh Devolved Social Services Program. Manila. 2011 Asian Development Bank. All rights reserved. Published in 2011. Printed in the Philippines. 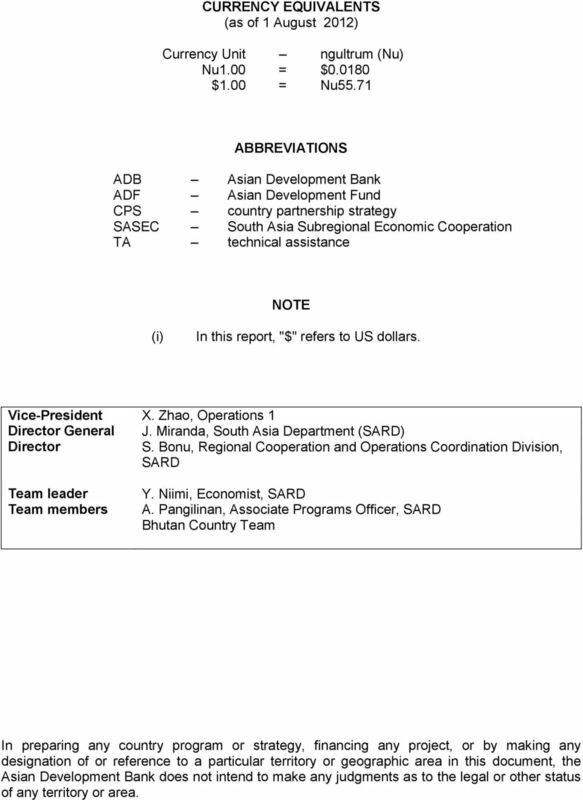 2011 Asian Development Bank All rights reserved. Published in 2011. Printed in the Philippines. ISBN 978-92-9092-483-8 Publication Stock No. RPT114096 Cataloging-In-Publication Data Asian Development Bank.